Polina Veksler and Alexandra Waldman were tired of the fashion industry standard. 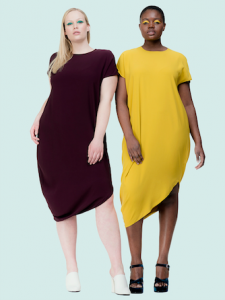 So, in September 2015, they launched Universal Standard: a size-inclusive apparel brand. Universal Standard has grown since that launch. Where they were once in Waldman’s one-bedroom apartment, the brand is now bicoastal with a showroom in New York and Seattle. In mid-November, they’ll be launching the Tria Collection with Danielle Brooks. The line will feature the three pieces Danielle wishes she always had in her wardrobe, but couldn’t find. “But we also have some other really incredible things coming out. So be sure to watch the space,” teases Waldman. Currently, they’re on a 12 city tour (Columbus, Oct. 31) that features a pop-up shop and model search. Waldman says that it’s also rewarding to meet people who haven’t heard of the brand yet, to hear their feedback, and to see Universal Standard clothes on them for the first time. “The whole experience has just been wonderful,” says Waldman. Learn more about Universal Standard online at www.universalstandard.com.